Fairfax Connector bus stops on westbound Route 7 between Spring Hill and Tyco roads in Tysons Corner will remain in their relocated positions on Tyco Road next to The Adaire apartments and an adjacent public park this week. A related lane closure along Route 7 westbound will also be required Monday through Friday; see details below. Fairfax Connector buses 424, 432, 494, 495 and 574 will be affected. 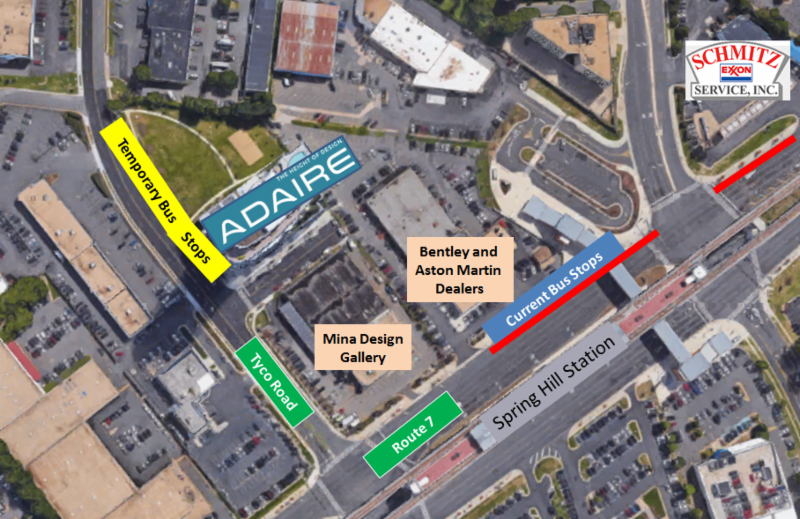 Pedestrian traffic will use the existing sidewalks along Route 7 in front of the Bentley and Aston Martin auto dealerships and Mina Design Gallery, and along Tyco Road to access the temporary bus stops. Access to all businesses will remain open. When: Monday, June 4, through Thursday, June 7, from 9 a.m. to 3 p.m.
Friday, June 8, 9 a.m. to 1 p.m.
* Drivers turning left from Westwood Center Drive or right from Spring Hill Road to Route 7 west toward Route 267 should note the closing of this section of Route 7.